"Rabbits are supposed to like carrots... but I hate carrots" was part of the original slogan for which cereal? This cereal was described on the box as "the sweetened high-fiber cereal with a nut-like taste." 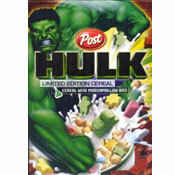 According to an ad for this cereal, "America's waking up to the importance of fiber in their diet. 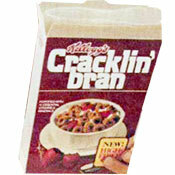 And Kellogg's new Cracklin' Bran is a high-fiber cereal with a rich, hearty flavor you're gonna love. The facts about fiber on the back of our new package are impressive. But not nearly as impressive as your first taste of delicious new Cracklin' Bran! Nature's fiber - Kellogg's taste." This cereal later became Cracklin' Oat Bran, with the word "oat" added to the name. What do you think of Cracklin' Bran? I can't find Cracklin' Bran in Xenia, Ohio. I wish I could find some. I liked the original recipe/version of the Cracklin' Bran Cereal. Since they changed the recipe and shape (made the O' larger with a bigger hole), it isn't as crispy and just doesn't taste the same. It used to be my favorite cereal until it changed. I still like it but wish it would go back to the original shape, crunch and taste! Agree with the 'shrinkage' comment. All time best cereal though. This cereal is very tasty, but expensive! It has fallen victim to the "shrinking box syndrome" in which the carton gets ridiculously small. Look for it on sale because it's very much worth it then.